Itslife focus on genuine leather wallets and bags.Known as "Show the spirit of design and quality" Its bags' life,its your life. 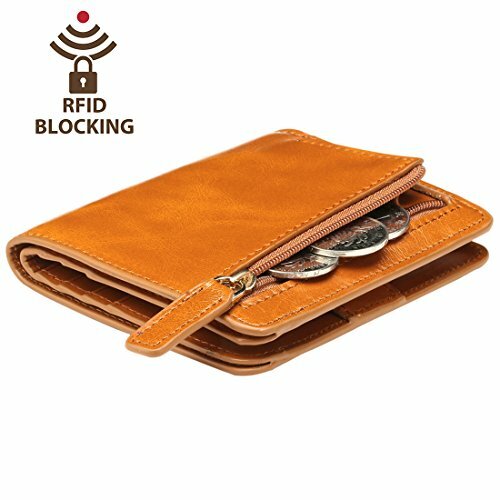 This Itslife small compact wallet designed to block Radio Frequency Identification (RFID) signals from penetrating your wallet and scanning RFID chips located in your credit cards, debit cards, ID cards, your license, and other things you carry in your wallet, offers security and privacy at a premium. Protect yourself from digital pickpockets with a cute small compact, genuine leather wallet that also blocks RFID signals. Get the Wallet today and enjoy the peace of mind that comes with it. Best Gift Great buy for yourself or as a gift for her on Birthday, Anniversary, Mothers' Day, Thanksgiving, Christmas, and all other holidays! 2.There may be a bit smell when you get this bag, since it's new & unused. You could open the package and put it in a ventilate place for a few days,then the smell will fade away. 3.Pay attention to moisture, water, grease.Oil waxed cowhide is made of top layer leather which is seems more shiny or glossy after the process of superficial by burnishing, oiling and waxing, just like add wax oil into leather.It is a fashion craftwork of leather with vintage artistic effect. The wallet made of Oil waxed cowhide, which has many irregular wrinkles, and clear texture. This is natural leather texture formation, also is the characteristics of Oil wax cowhide. The longer the better,the leather will be more luster; the more likely they were to have lasting appeal.